FTC Disclosure: I was provided a free meal from Birra Vino’s Pizzeria and a free paint station from Something from Nothing Paint Parties in exchange for social media amplification and a blog post. All opinions are my own. Considering I’m in this picture, it seems obvious that I didn’t take it but felt like I should clariy that it’s courtesy of Something From Nothing Paint Parties. Do you ever just need an evening away with friends for a creative activity and great food? Of course you do. I recently had that opportunity and am so grateful for the experience. 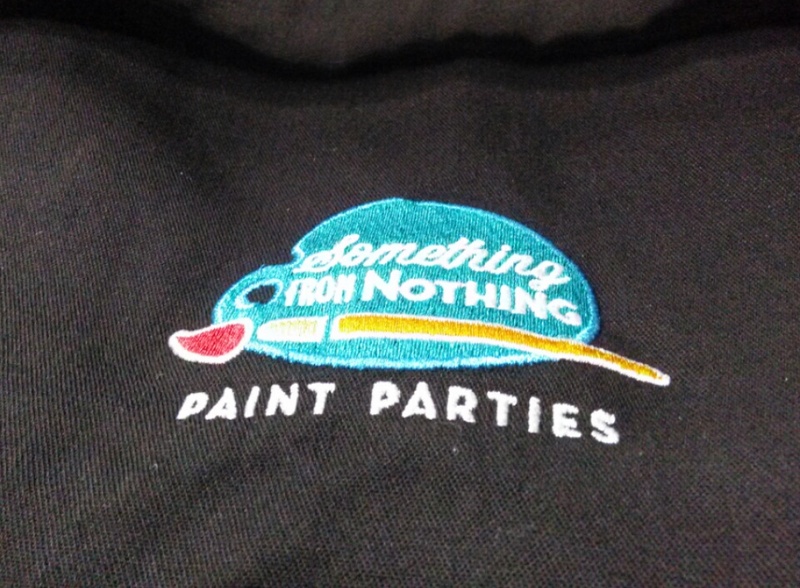 You may remember that my friend Sarah started a new company more than a year ago called Something From Nothing Paint Parties. It’s one of those group paint party companies but instead of everyone going to a big studio, Sarah brings the party to you. These parties are a great thing for team building, girls’ night out, couples, and whomever! This is my second one, actually. Last year, I participated in a paint party at Sarah’s house and had such a great time I knew I wanted to do it again! This time, it was a lot different! 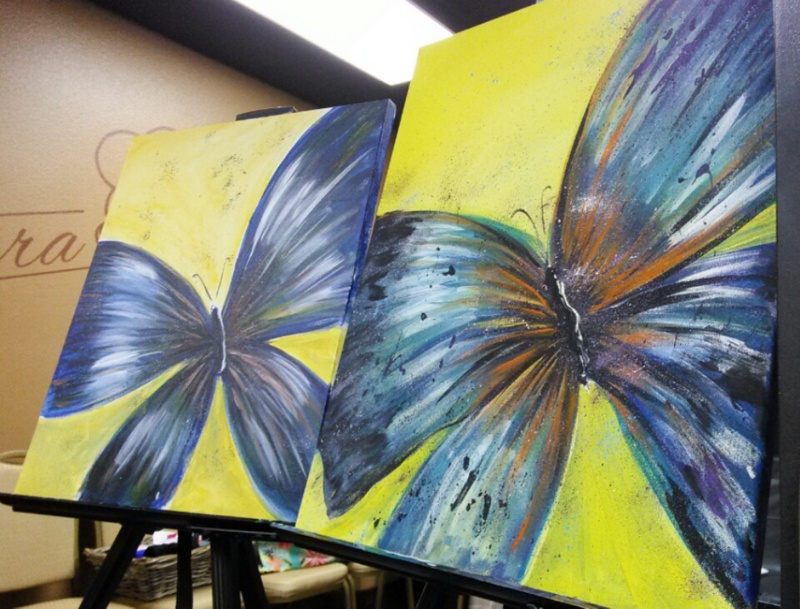 See, she recently teamed up with a relatively new restaurant there in Siloam Springs called Birra Vino’s Pizzeria to offer monthly open paint parties for anyone who wants to sign up (usually you are invited by a hostess and the hostess chooses the painting). 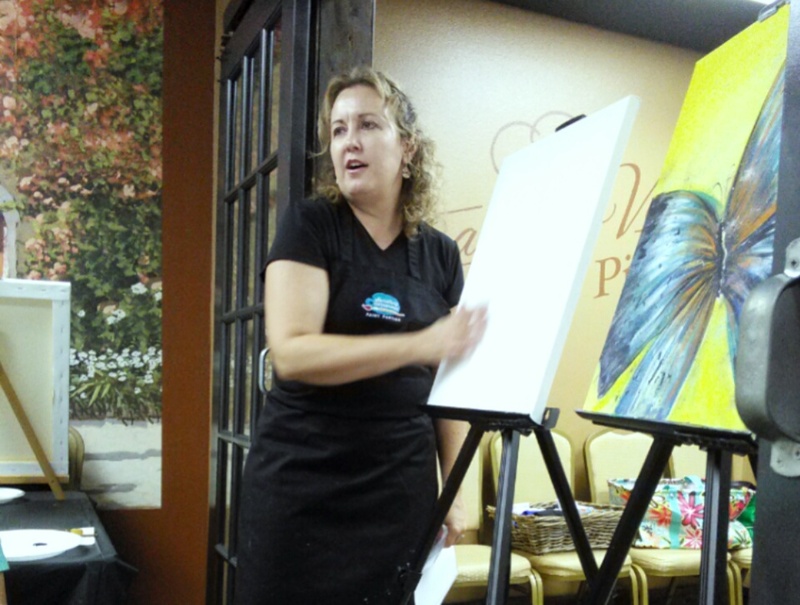 The paint parties are the fourth Saturday every month until the holidays. The cost for the party is $30 in advance. Guests are encouraged to come about an hour or so before the paint party starts to enjoy a delicious handmade meal in a really friendly atmosphere. This guy greets you as you come in. I love pizza! And both Sarah and her husband, Chris, said this new place was fantastic. So, I had to go try it out. After all, if I’m driving to Siloam Springs I should really make a full night of it, right? The irony of all this is, it’s a pizzeria and I ended up not getting the Godfather pizza (think like Supreme pizza on steroids) like I thought I would. 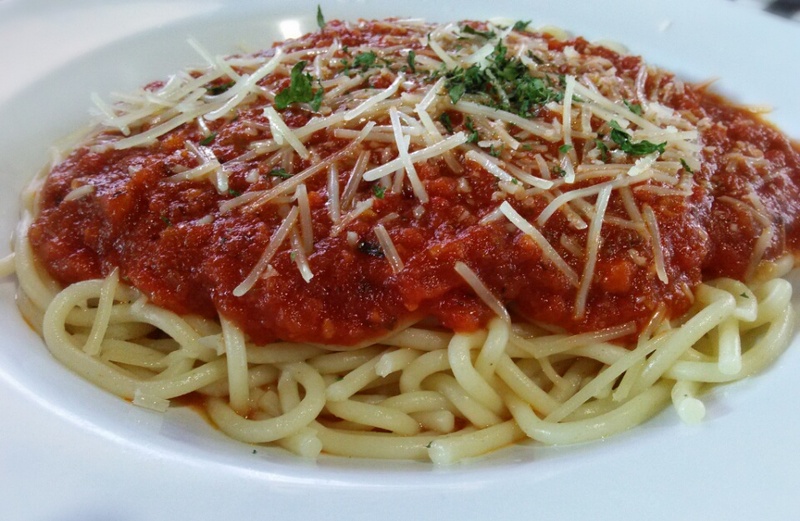 All the sudden, all I wanted was a big ol’ plate of spaghetti. And dang, was it big! Of course, I started out with a salad. This was not your usual dinner salad that was all whitish Iceberg lettuce with a token tomato. Check this out! 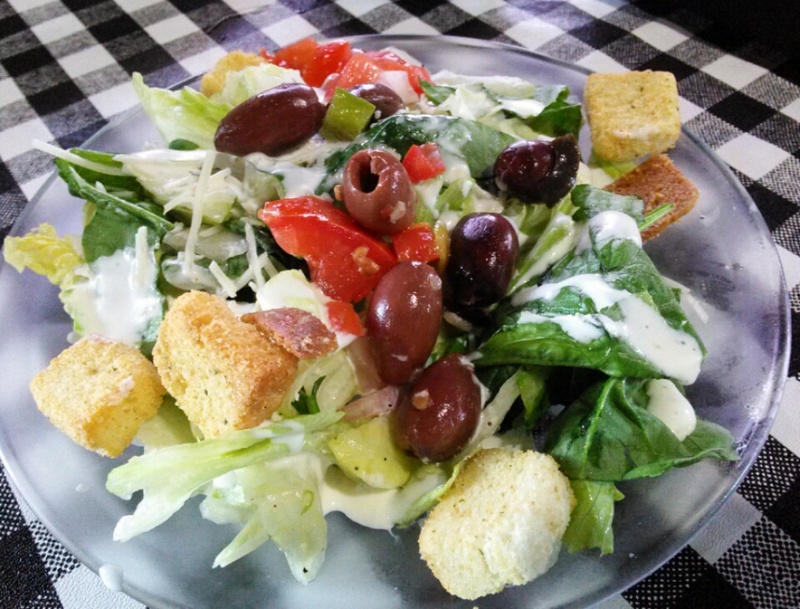 The salad was so good and of course, I got the house ranch. Because, ranch. Here’s where it gets odd for me. I keep hearing that spaghetti and fried chicken are great food partners but I never could get convinced. I also don’t usually handle the grease from fried chicken very well so I rarely order it. Something just clicked in my head that night and when I heard the Saturday special was fried chicken and spaghetti, I jumped on it. OK, I finally get it. 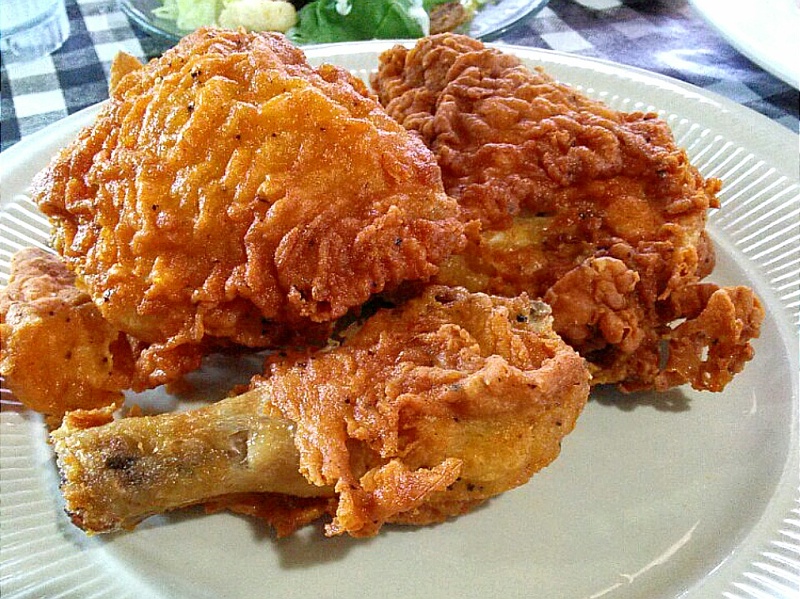 Fried chicken and spaghetti go great together, at least at Birra Vino’s. I loved how crispy and moist but not greasy the chicken was. You get a pretty large portion, too. I figure if you’re going to be eating fried chicken, it should have a good crunch on the outside without the breading taking over the chicken on the inside. This was perfect! 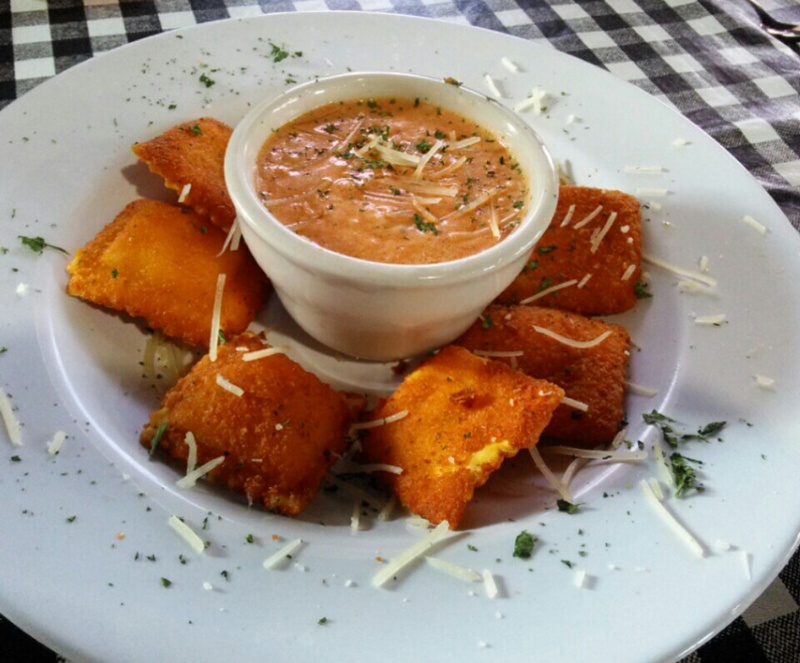 We ordered an appetizer for the table to share and that was great, too! The ravioli with their special sauce is delicious! It’s a combo between alfredo and marinara sauce and I love that blend. 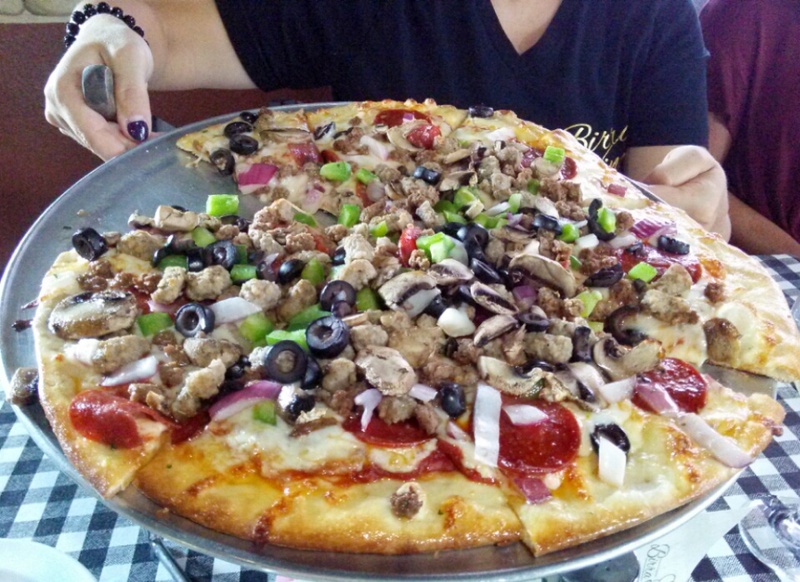 I would be remiss if I didn’t ask people who ordered pizza if I could get a picture of their pizza. I just explained that I was a blogger and that it was totally normal to take pictures of food in public. LOL! I thought going into this paint party that Sarah and Chris (her assistant for the evening) would be the only people I knew but I got a big surprise! OK, JBU friends…remember Steve and Cathy from the cafeteria? They were manager/assistant manager until about 1998. Cathy’s daughter Emilee who worked in the Caf as a teen was at the paint party! In fact, Cathy owns Birra Vino’s! What a great blast from the past! I missed seeing Cathy but will look for her next time for sure. It was so nice to get to know Emilee as an adult and meet so many of her teacher friends. I left feeling like I had made several new friends. So, on to the paint party portion of the evening. Sarah sets up empty canvases at each station with all the water, paint, and brushes you’ll need. You also have an apron (I still manage to get dirty because I’m messy). Sarah always has a finished example of the paintings we will do so we have something to look at. She then takes people through step-by-step into creating our own. I want to emphasize here that these are not painting lessons. 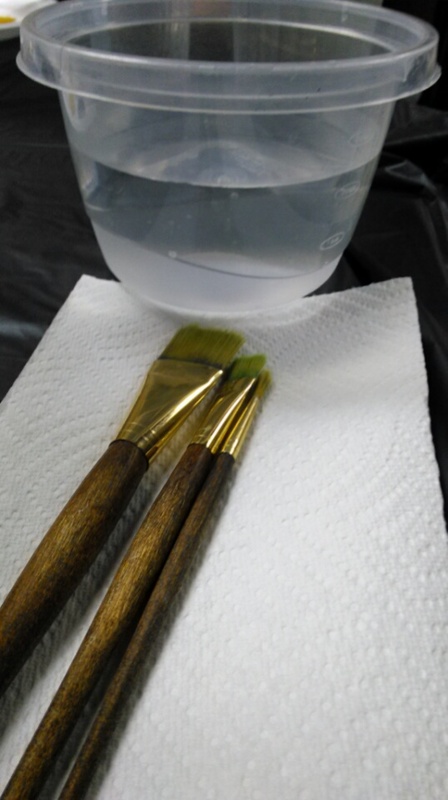 It is a fun experience where you create a painting. Sarah is an incredibly patient teacher. Each person’s painting looks a little bit different as you can see in the first picture. Even paintings done by the same person a year apart turn out different! The one on the right is Sarah’s example from a year ago and the one on the left is the painting she did as she demonstrated. I always get a little worried that mine will look awful by the time I’m done. But it’s always a good lesson that we can’t judge our ending by the middle of our journey. 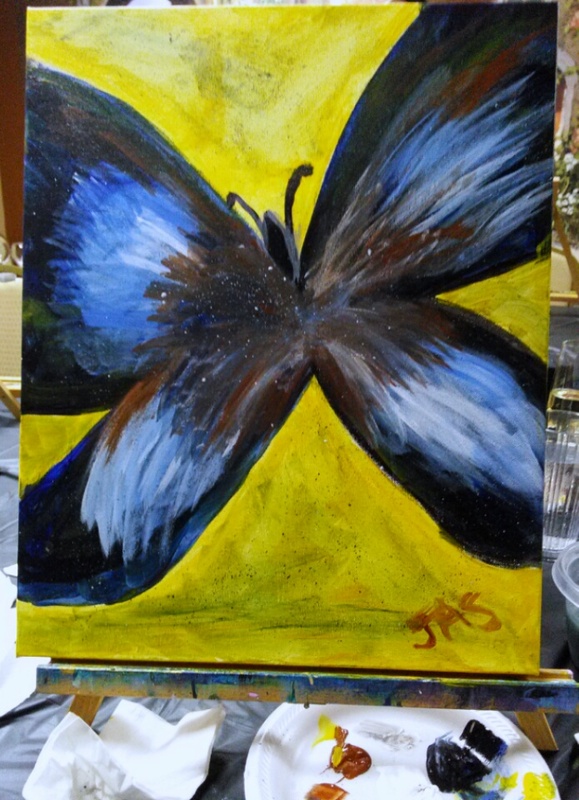 My butterfly was looking pretty lame at this point. But, as you go along the painting really starts to take shape and you just might learn a new technique or two. Remember flicking toothpaste on the mirror with your toothbrush as a kid? 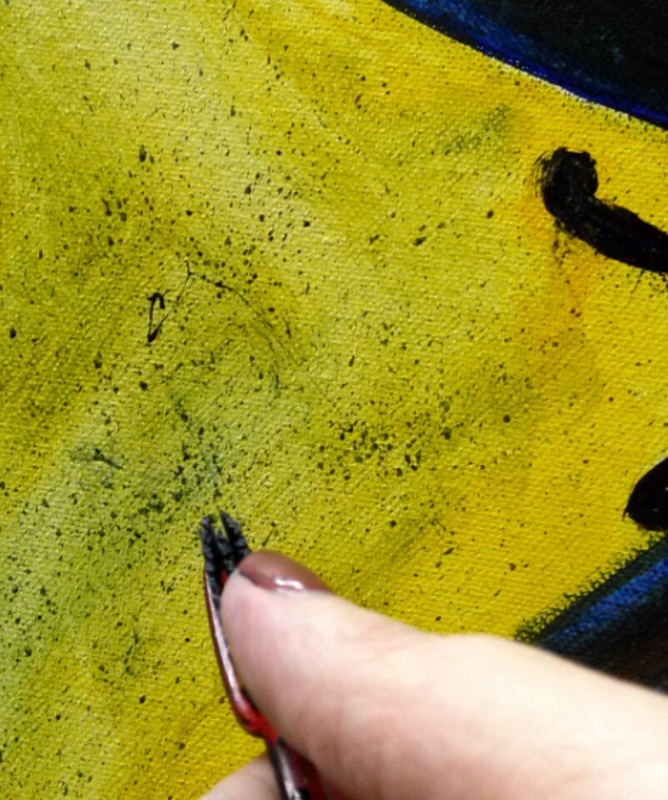 We used a similar technique to get splatter on our paintings. I cleaned my hands before taking this picture! By the end of the night, I had lots of fun, a belly full of great food, and a painting for my writing office wall! The open paint parties are the fourth Saturday evening each month. You can also schedule private parties with Sarah. 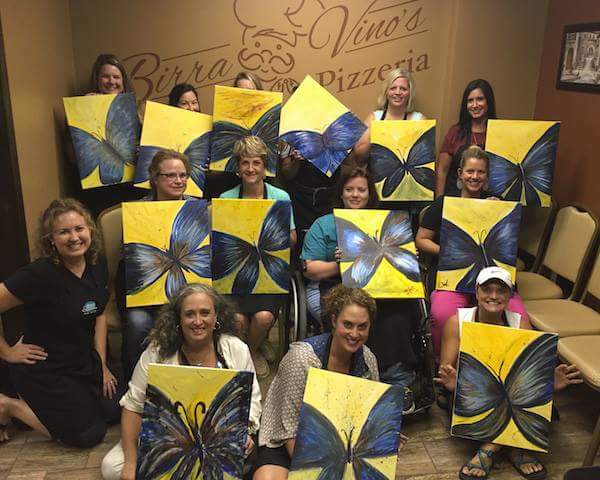 Learn more about each paint party at Birra Vino’s on Facebook. Jamie, It was so fun to have you at another party! It’s always exciting to watch each person’s creation take shape, but yours was especially thrilling for me this time! You started so dark. Your butterfly was bold & beautiful by the time you were done! Great job! Truly a creation to be proud of! Jamie, we had so much fun and enjoyed having you there! I love seeing creativity come alive in people. 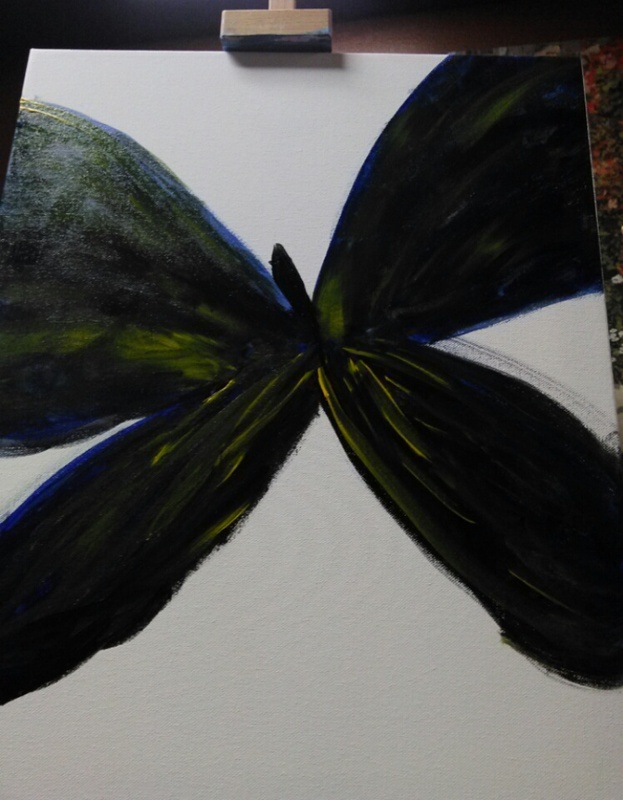 Some have experience art by painting for the very first time. I also love how it brings people together just like it did for you! So many connections between people, businesses, families and friends are built by pushing some pretty colors around on canvas! I feel very privileged to have a front row seat to see art at work. Thank you! Cool, I have never done a paint party. Sounds like a really fun evening! I may have to go back up to Siloam and check this place out for the food if nothing else!